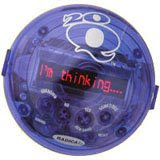 Did you ever play Twenty Questions as a child? Or adult for that matter? I'm sure I did at least once or twice, but it was never as fun as it is NOW! Yesterday (see post below this one) I got a surprise package from someone. Who, I don't know. I'm getting closer to making a very good guess about the sender, though. Included in the package was this Twenty Questions game. I kind of giggled when I saw it because I had bought the same thing for one of the sons of my daughter's ex-boyfriend this past Christmas. In fact, even though I had already seen the card's envelope with "Skittles" written on it, I briefly thought my gift was being returned. So.. I'm sitting there munching on the candy, and I start playing Twenty Questions. I have to say this thing is SO friggin' COOL! I played it sitting next to hubby as he played Sims. I played it while watching American Idol. I played it for while instead of reading at bedtime. When I couldn't get to sleep, I played it for a while before going to play some Sims. It correctly guessed what I was thinking at least 95% of the time! It even guessed "cigarette"!!!!! I wonder if it would win if I thought about Cheap Blinds? Dude, I had one of these, it IS a lot of fun!! I think it only took me about a week before I wore the battery out. Yikes, I AM talking about the 20Questions game!! That sounds like something I should probably stay away from. oh my mom has one of these! they are awesome... my sister sent one to her guy friend in Iraq... and being a guy he decided to choose (excuse my language here..) @$$hole as his object for the thing to guess -and guess WHAT!? it Guessed sphincter!!! I want oneeeee! Where can I get it? Wally World maybe?